Being billed as a place where America’s favorite pastime meets up with mid-America’s greatest resort community, Ballparks of the Ozarks soon will be moving forward with construction. In November, paperwork was being finalized. Bulldozers were scheduled to arrive at the site to start clearing land in early December. "We’re really excited that things are on track to have some ball [in 2016],” said Bob Ramsey, Ballparks of the Ozarks, LLC co-owner and chief operating officer. He said the project, to be built on 239 acres off Highway 54 in Macks Creek, seemed to get off to a slow start because engineering tests to determine the amount of rock and type of dirt at the site took a little longer than anticipated. However, the results were worth waiting for as those tests all produced good results and proved that they had chosen a good site for the project. Now that they’ve gotten the go-ahead from the engineer, Ramsey said they’ll be using the winter months to clear as much land as possible. Once the ground thaws in the spring, construction will begin on Phase I. 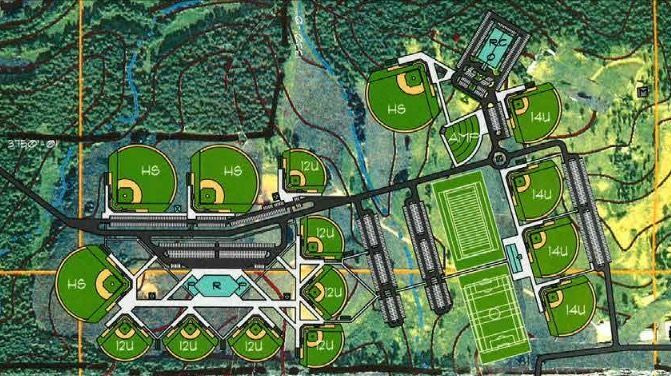 That phase will include eight lighted baseball/softball fields and two large rectangle, multipurpose fields where football or soccer could be played. All the fields will be lighted and will include parking nearby. All eight fields will have artificial turf infields. Phase I will also include an indoor facility where batting cages, specialty training space and corporate offices will be housed, and a concession area that will offer restaurant-quality fare. Phase II, to be constructed as need demands, will include additional fields and supporting amenities.